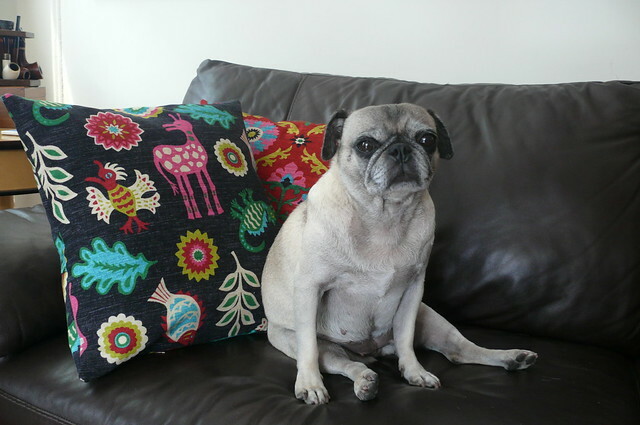 Home Dresses	Pug Pillow Makeover! OK, I’ll be honest… there’s almost nothing I’d rather not do than sew home dec stuff. I’m just not into it! And I’m really not good at interior design or picking out things that go together in my apartment- it’s a pretty basic setup chez Ginger! So when Julie at Mood asked if I’d like to do a special project to celebrate the opening of Mood’s new home dec showroom, I was like, “No, thanks!”. Not my cup ‘o’ tea! Fast forward a few days, and I get a rare, unprompted sewing request from Man Friend to make some curtains for our bedroom (we have blinds, but they’re looking pretty rough these days). How can I say no to him? So, I emailed Julie to say I was in and headed for Mood! The new showroom is bright, spacious, and located in the lobby of the building Mood occupies (they’re on the second floor). It’s such a great space for inspiration! I was immediately drawn to these two fabrics, annnnnnnnd the second I saw them, I put the thought of curtains right out of my mind and decided to make some pillows for the living room. 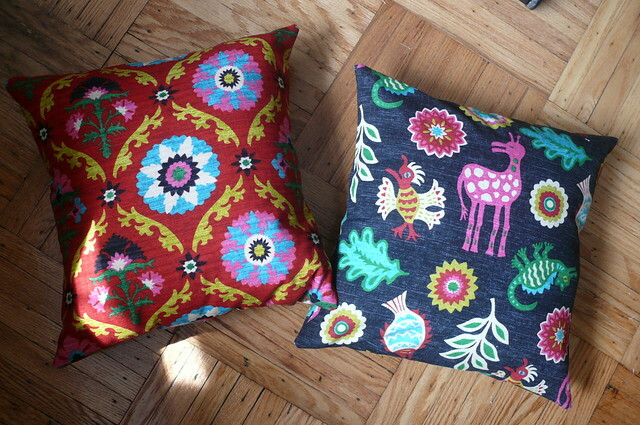 These are both Waverly fabrics, and they’re 100% cotton. 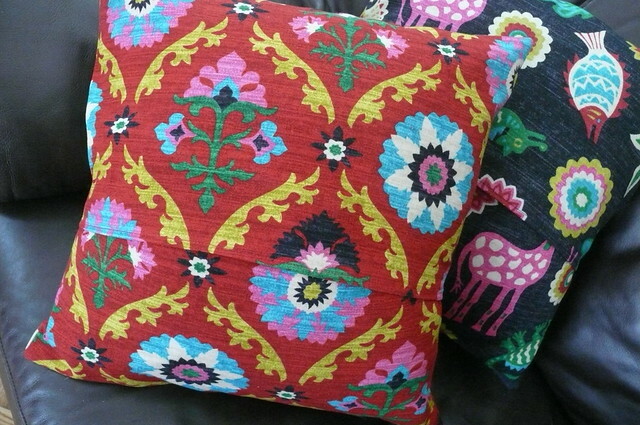 The blue one with the animal print is called “Mexicali”, and the red floral is called “Mayan Medallion” (here are some great Waverly prints on the site). They feel like canvas, and have a nice heft. I used a simple envelope-style closure for these so I can easily slip them off to clean them. Although I’m never motivated to sew home dec items, these are probably the easiest things I’ve ever sewn. EVER. So easy. So fast. Why don’t I do this more often, people? 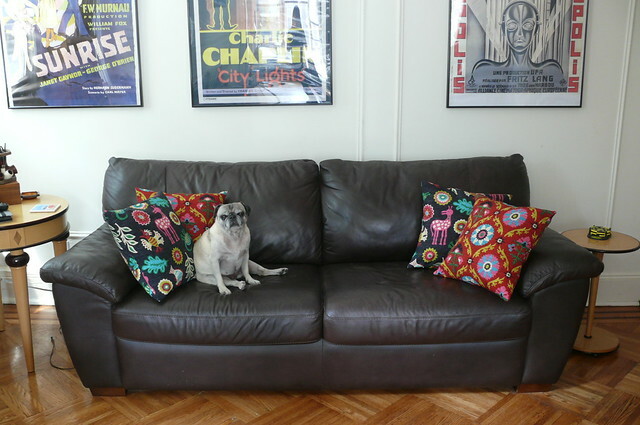 The pillows we had on the couch previously were a gift and have seen a fair amount of wear and tear, thanks to the pugs co-opting them to use as beds. So this is an awesome upgrade! They add a great burst of color to the living room without overpowering a small space that doesn’t get much natural light. Plus, they pick up on the colors in the framed prints we have hanging throughout the living room. Hopefully now things look a little less hodge-podge and a bit more intentional! 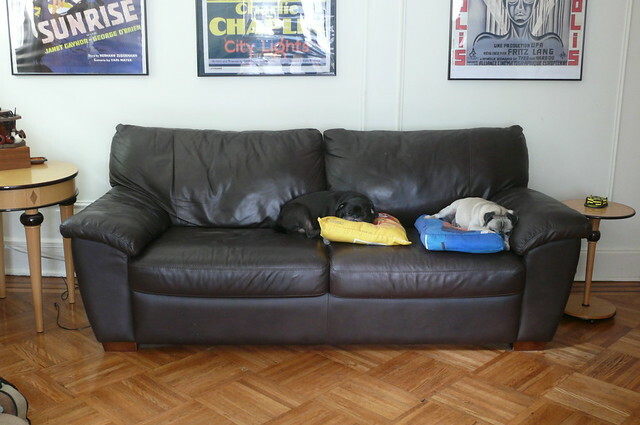 Don’t worry- the pugs have already adopted the new pillows! And I’m even energized to make the curtains for Man Friend after this painless sewing experience, so it’s a happy ending all around! Home dec for the win! OK, guys- honest truth… do you sew things that your partner/roommate/kid/parent requests? And how do you feel about sewing home dec? What are some easy projects that can revamp your home?